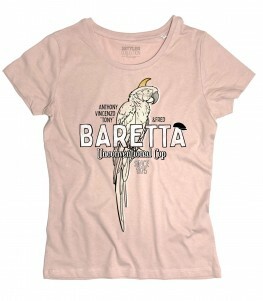 Baretta t-shirt – T-shirt donna ispirata a Tony baretta l’improbabile poliziotto italo-americano protagonista dell’omonima serie. Trasandato, sempre in jeans e maglietta e con uno stuzzicadenti in bocca, Baretta combatte il crimine di Los Angeles utilizzando il suo punto di forza: i travestimenti. Protagonista della maglietta e il suo indimenticabile pappagallo bianco Fred, con cui il poliziotto divide una stanza d’albergo. 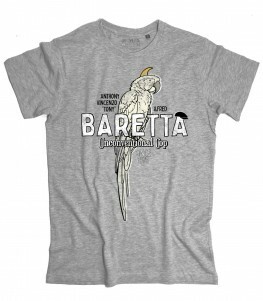 Baretta t-shirt – Women’s t-shirt inspired by Tony Baretta, the unlikely Italian-American policeman, the stars in the series of the same name. Scruffy, always in jeans and a t-shirt and with a toothpick in his mouth, Baretta fights Los Angeles crime using its strong point: the disguises. The protagonist of the shirt is your unforgettable white parrot Fred, with which the policeman shares a hotel room. Boba Fett t-shirt – T-shirt uomo bianca raffigurante il famoso casco del cacciatore di taglie Boba Fett e la scritta Boba Says Relax. 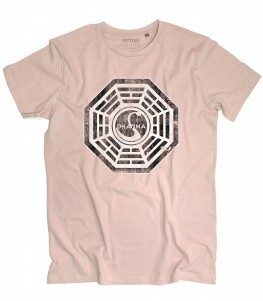 Questa t-shirt si ispira e ricorda la t-shirt cult con la scritta “Frankie Says Relax” dei Frankies goes to Hollywood. 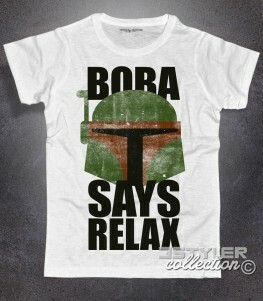 Boba Fett t-shirt – White man t-shirt depicting the famous bounty hunter Boba Fett helmet and the words “Boba Says Relax”. 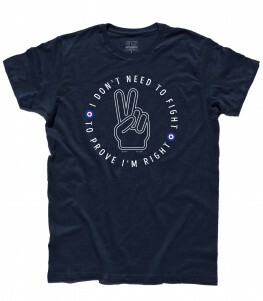 This t-shirt is inspired by and reminiscent of the cult t-shirt that says “Frankie Says Relax” of Frankies goes to Hollywood. 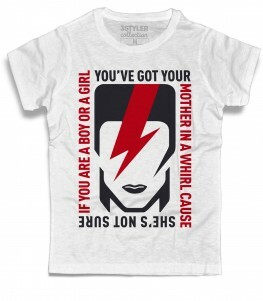 David Bowie t-shirt uomo bianca – T-shirt ispirata alla canzone Rebel Rebel di David Bowie: “You’ve got your mother in a whirl, She’s not sure if you’re a boy or a girl…”. Composta da Bowie nel 1974, divenne un inno del movimento glam: in essa vengono perfettamente espressi la voglia di ribellione e di espressione tipica dei movimenti giovanili. 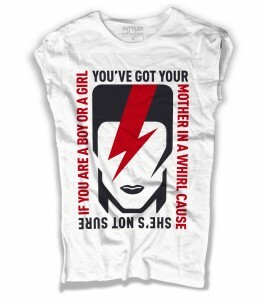 David Bowie white men’s t-shirt – T-shirt inspired by the song Rebel Rebel by David Bowie: “You’ve got your mother in a whirl, She’s not sure if you’re a boy or a girl …”. 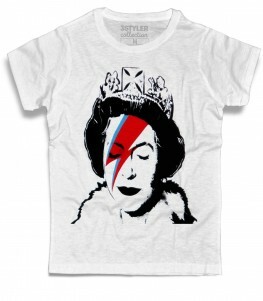 Composed by Bowie in 1974, it became an anthem of the glam movement: in it the desire for rebellion and expression typical of youth movements are perfectly expressed. 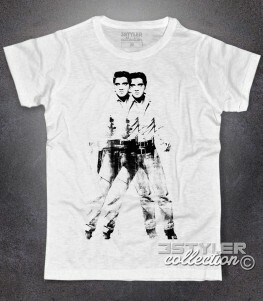 Double Elvis t-shirt uomo bianca – T-shirt ispirata al capolavoro dell’arte pop “Double Elvis” in cui compare the King nelle vesti insolite di un cowboy nell’atto di sparare. Ritroviamo nell’opera uno delle caratteristiche più famose di Wahrol, ossia la ripetizione del soggetto rappresentato. 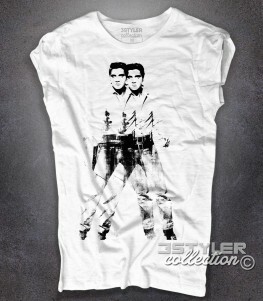 Double Elvis white men’s t-shirt – T-shirt inspired by the pop art masterpiece “Double Elvis” in which the King appears in the unusual outfits of a cowboy in the act of shooting. We find in the work one of the most famous features of Wahrol, that is the repetition of the represented subject. Frank Zappa t-shirt uomo raffigurante il volto di Frank Zappa in versione antichizzata. 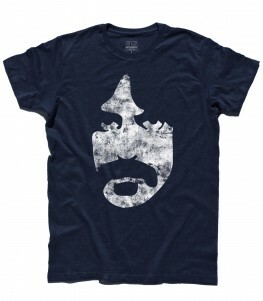 Frank Zappa men’s t-shirt depicting the face of Frank Zappa in an antiqued version. Frau Blücher felpa – Felpa unisex ispirata al fim cult Frankestein Jr ed in particolare al personaggio di Frau Blücher, la terribile governante del castello del dottor Frankestein. Ogni volta che nel film viene pronunciato il nome Frau Blücher i cavalli nitriscono e si impennano come impazziti, da qui la rivisitazione ironica del logo della Ferrari raffigurante un cavallo che si impenna e la scritta Frau Blücher. Frau Blücher hooded sweat – Unisex hooded sweat inspired by the cult fim Frankenstein Jr. and in particular the character of Frau Blucher, the terrible ruler of the castle of Dr. Frankenstein. 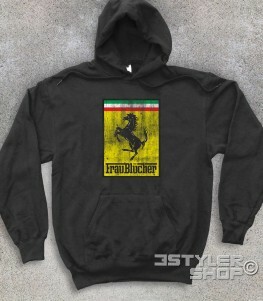 Whenever the film is pronounced the name Frau Blücher the horses neighing and prancing like mad, hence the ironic reinterpretation of the Ferrari logo depicting a horse that rears up and the word Frau Blucher. 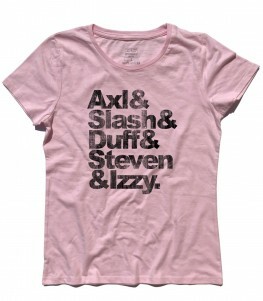 Goonies t-shirt – T-shirt donna raffigurante Agatha la terribile mamma e boss della Banda Fratelli di cui fanno parte i figli Jake, Francise e Sloth. Compare tra i protagonisti dei Goonies, film cult dei meravigliosi anni 80 e si distingue per la cattiveria, i capelli unti, l’accento siciliano, una lunga collana di perle e un tatuaggio variopinto sul braccio sinistro, unici tocchi di colore sulla mise tutta nera. 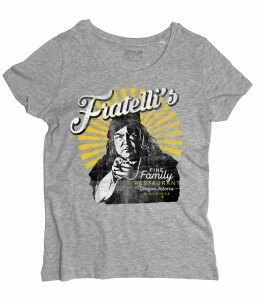 Goonies t-shirt – Women’s t-shirt depicting Agatha the terrible mom and boss of Fratelli’s consisting of your children: Jake, Francise and Sloth. It’s among the protagonists of “The Goonies”, cult film of the wonderful 80s and is distinguished by the wickedness, your united hair, the Sicilian accent, a long pearl necklace and a colorful tattoo on the left arm, unique color touches on the black of her clothing. 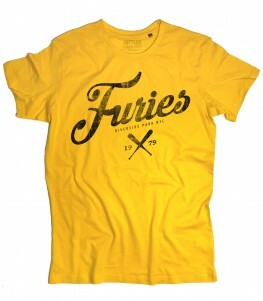 Goonies t-shirt – T-shirt uomo raffigurante Agatha la terribile mamma e boss della Banda Fratelli di cui fanno parte i figli Jake, Francise e Sloth. Compare tra i protagonisti dei Goonies, film cult dei meravigliosi anni 80 e si distingue per la cattiveria, i capelli unti, l’accento siciliano, una lunga collana di perle e un tatuaggio variopinto sul braccio sinistro, unici tocchi di colore sulla mise tutta nera. 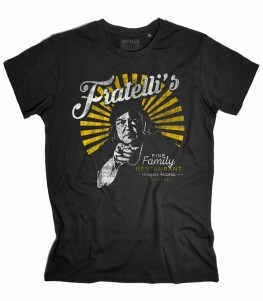 Goonies t-shirt – Men’s shirt depicting Agatha the terrible mom and boss of Fratelli’s consisting of your children: Jake, Francise and Sloth. It’s among the protagonists of “The Goonies”, cult film of the wonderful 80s and is distinguished by the wickedness, your united hair, the Sicilian accent, a long pearl necklace and a colorful tattoo on the left arm, unique color touches on the black of her clothing. I hate Everyone t-shirt – T-shirt bambino raffigurante un arcobaleno con all’estremità due zuccherose nuvole e la scritta “I hate Everyone”. Ispirata ai personaggi cult anni ’80 dei Care Bears, gli Orsetti del Cuore, questa t-shirt gioca ironicamente contrapponendo l’ambiente tutto amore, pace e felicità tipico del mondo dei care Bears e il significato della scritta sopra l’arcobaleno: IO ODIO TUTTI. 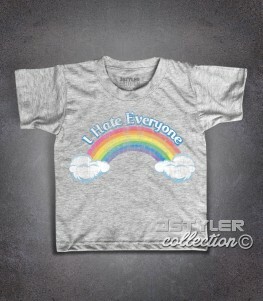 I hate Everyone t-shirt – Kids t-shirt depicting a rainbow at the end with two sugary clouds and the words “I Hate Everyone”. Inspired by the years 80s cult characters of the Care Bears, this t-shirt plays ironically contrasting the environment all love, peace and happiness typical of the Care Bears’ world and the meaning of the written over the rainbow. Ispettore Callaghan t-shirt donna bianca – T-shirt raffigurante Clint Eastwood nei panni dell’ispettore Callaghan della polizia di san Francisco. Harry, che ha la fama di essere il “duro” per eccellenza, viene soprannominato Dirty Harry (nella serie italiana Harry la carogna) dai suoi colleghi per i metodi poco ortodossi nel combattere il crimine. 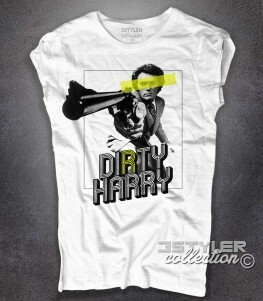 Dirty Harry white woman t-shirt – T-shirt depicting Clint Eastwood in the role of the inspector Callahan of the police of San Francisco. Harry, who has the reputation of being the “hard” par excellence, is nicknamed Dirty Harryby his colleagues for the unorthodox methods of fighting crime. Ispettore Callaghan t-shirt uomo bianca – T-shirt raffigurante Clint Eastwood nei panni dell’ispettore Callaghan della polizia di san Francisco. Harry, che ha la fama di essere il “duro” per eccellenza, viene soprannominato Dirty Harry (nella serie italiana Harry la carogna) dai suoi colleghi per i metodi poco ortodossi nel combattere il crimine. 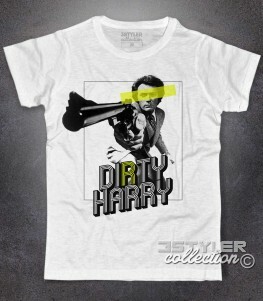 Dirty Harry white men’s t-shirt – T-shirt depicting Clint Eastwood in the role of the inspector Callahan of the police of San Francisco. Harry, who has the reputation of being the “hard” par excellence, is nicknamed Dirty Harryby his colleagues for the unorthodox methods of fighting crime. Jessica Fletcher t-shirt – T-shirt bambino raffigurante l’intramontabile Angela Lansbury nelle vesti della “temibile” Jessica Fletcher, protagonista della serie “La signora in giallo”. Se per caso vi trovaste per le strade della graziosa Cabot Cove e vi imbatteste in una simpatica vecchietta dai capelli cotonati e l’aria arguta, mi raccomando CAMBIATE STRADA! Chi avete di fronte porta infatti più sfiga di un gatto nero che, nel passare sotto una scala, rompe accidentalmente uno specchio con la zampa. La buona vecchia Jessica vanta infatti più vittime del killer dello Zodiaco; se la incontri o finisci in prigione accusato di omicidio o vieni ammazzato dal killer di turno. 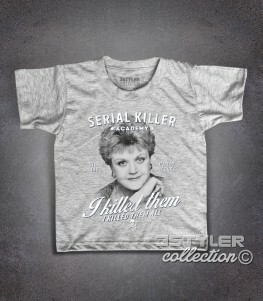 Jessica Fletcher t-shirt – Kids t-shirt depicting the timeless Angela Lansbury in the role of the “fearsome” Jessica Fletcher, star of the series “Murder, She Wrote”. If by chance you walk on the streets of the pretty Cabot Cove and you meet a nice old lady from the big hair and the witty air, I recommend CHANGE THE ROAD! Who you meet in fact, brings bad luck more of a black cat, in passing under a ladder, accidentally breaks a mirror with his paw. Good old Jessica has in fact most of the victims of the Zodiac killer; if you know her or you go to jail charged with murder or you come killed by the serial killer on duty. Jessica Fletcher t-shirt – T-shirt donna raffigurante l’intramontabile Angela Lansbury nelle vesti della “temibile” Jessica Fletcher, protagonista della serie “La signora in giallo”. 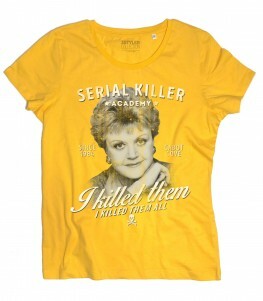 Jessica Fletcher t-shirt – Women’s t-shirt depicting the timeless Angela Lansbury in the role of the “fearsome” Jessica Fletcher, star of the series “Murder, She Wrote”. 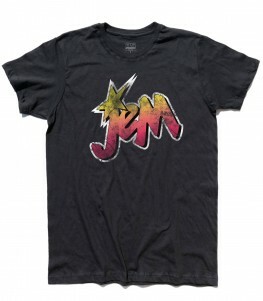 Jim Morrison t-shirt uomo raffigurante il volto di Jim Morrison in versione antichizzata. 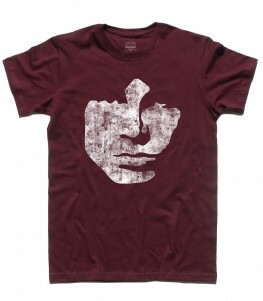 Jim Morrison men’s t-shirt depicting the face of Jim Morrison in an antiqued version. 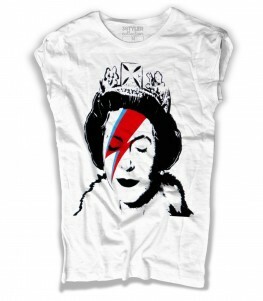 T-shirt uomo raffigurante Lady Oscar, la spadaccina più affascinante di tutta la Francia. 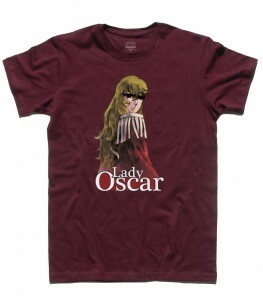 – Men’s t-shirt depicting Lady Oscar, the most fascinating swordswoman in all of France.